1. A toy dustpan and brush set with a miniature broom. We bought this little set when we realised how much Milin loved watching the big people around the house sweep the floor. The broom is undoubtedly his favourite toy, or household object. He spends much of the day sweeping, and it is the first thing he looks for after getting out of his high chair after a meal. Let’s hope this behaviour continues. 2. The golf set. Again, this was bought by the Little Mister’s grandma when it became apparent that his favourite bit of sporting equipment was his grandfather’s golf clubs. The much lighter toy versions keep him occupied for hours. 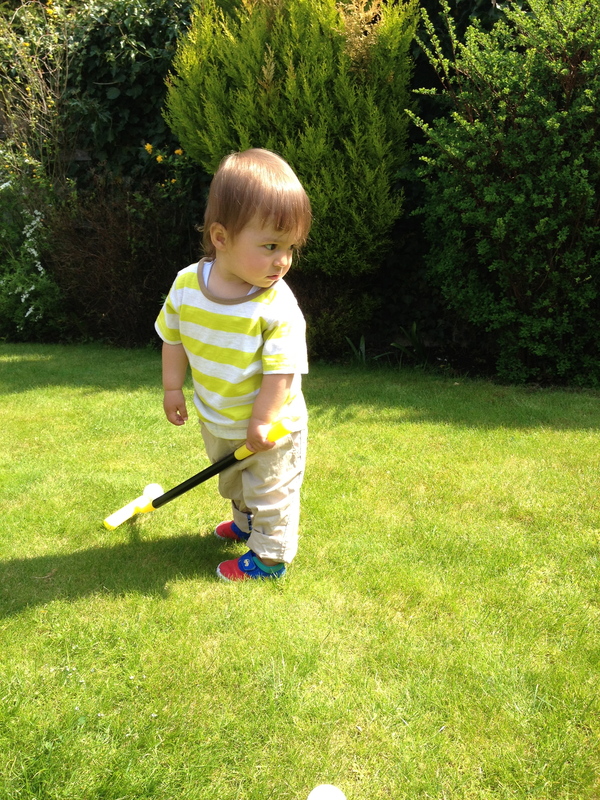 He is happy using a tennis ball, toy golf ball, lightweight plastic ball, leather football or foam ball with the clubs. It doesn’t matter – any ball will do. A close second favourite bit of sporting kit is a pair of mini tennis rackets he has just been given. I have a feeling he is going to like sport. 3. Pots, pans, wooden spoons and plastic containers. The Little Mister has one cupboard, the plastics cupboard, and he can open it up and sit in front of it for ages. His favourite object is usually a sieve. Wooden spoons come a close second. These implements are used for playing tennis and teething respectively. The cupboard’s contents are also useful for ‘cooking’ and ‘drumming’. 4. Books. There’s a few favourites, and some fall in and out of favour. But a book about animals, The Noisy Book, a book about a London Bus, and a couple of musical books which tinkle the tunes to ‘head, shoulders, knees and toes’ and ‘the wheels on the bus’ are long-term favourites. Thanks to the latter, he is also now able to point out his head, knees, toes, eyes, ears, mouth and nose. Shoulders are a bit trick, but at the end of the day, the Little Mister loves reading. 5. The box in the corner. It’s not on all the time, but CBeebies is my mealtime saviour. Postman Pat, Mike the Knight, and Wooly and Tig are the best at getting Milin to eat. At all other times of day he wants to watch tennis. He’s going to love Wimbledon. The Little Mister loves some other stuff too. He loves putting his shoes on because it means it is time to go outside. He loves singing and dancing – which consists of bending his knees, bopping, and swaying. He loves saying his favourite word ‘bubble’, he loves it when his daddy comes home. He loves his daddy’s bike. He loves ants (which he calls ‘na’) and he loves bath time – but he hates having his hair washed. Life, for the Little Mister, is about all of these things. In the corner of the kitchen, meanwhile, are boxes of all-singing, all-dancing fancy plastic toys. They stay in their boxes most days. This entry was posted in Uncategorized by Kiran Chug. Bookmark the permalink.